Icelandic sheep are very special; classed as a utility breed, they have been bred for their meat, milk and unique fleece. Meat from Icelandic sheep is considered a gourmet dish in Iceland. The meat is delicately flavoured and fine textured. 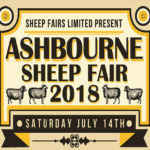 Because the lambs mature slowly, they can be slaughtered at 5 -6 months for a carcass of about 12 kgs, or kept until 18 months for a larger carcass. Icelandic ewes are very milky, and both very easy to tame and very greedy, making them good dairy animals. The Icelandic flleece is made up of two layers. There is a long, silky layer – the tog – made up of fibres up to 20 cm long, which helps make the fleece water-resistant. The very fine, soft shorter layer – the thel – with fibres approximately 8 cm long, helps make the fleece extremely warm and light. The ewes lamb easily, have very good mothering instincts and have an excellent milk supply to raise their lambs. They usually have twins, sometimes triplets. 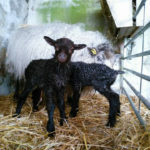 There is a distinct gene for multiple births, the thoka gene, and Icelandic sheep having this gene may have 5, 6 or even 8 lambs. Although the lambs are small at birth, they are very lively and are quickly up on their feet. The lambs grow at a great rate and can be ready for market by 4-5 months old. In parts of Iceland and North America Icelandic sheep are used as a dairy breed for milk production. It was through the Icelandic sheep’s hardiness and resilience that the earlier settlers were able to withstand the fierce Icelandic winters. 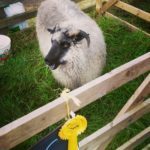 Because Icelandic sheep were taken to Iceland by the Vikings from 874-1100 AD, and bred in isolation there for hundreds of years, they are one of the oldest and purest sheep breeds in the world. They are recognized by DEFRA on their EGBAR list – as a globally endangered valuable genetic resource. 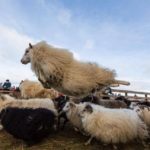 In Iceland there is a recognized gene for what are called Leader Sheep; these are highly intelligent sheep who watch over the rest of the flock, leading them in and out of their enclosures, and checking for danger while the others graze. Icelandic sheep feature prominently in the country’s history/legends – the sagas – and there are many tales of how a Leader Sheep looked after the others by refusing to leave shelter because a fierce storm was coming. You can’t talk about Icelandic sheep for very long without mentioning their personalities, whether they are friendly or shy, affectionate or bossy, they are very intelligent, with distinct characters. 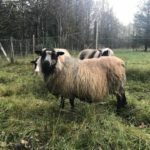 More than any other sheep breed that I’ve come across, Icelandic sheep owners will talk about how friendly, tame, and intelligent their animals are.